The Grand Prix of the Americas is one of the MotoGP paddock’s favorite races, because of the setting, the atmosphere, and the city of Austin. The layout of the Circuit of the Americas is beloved by many a rider. They love the challenge of threading the needle of Turns 2 through 10, the braking for Turn 11, Turn 12, Turn 1. They love the run up the hill to Turn 1, the sweep down through Turn 2, the fact that the back straight is not straight, but meanders like the straights at many great tracks. The front straight at Mugello wanders, the Veenslang at Assen is anything but straight, that adds an element of challenge to a straight. What the riders don’t love are the bumps. 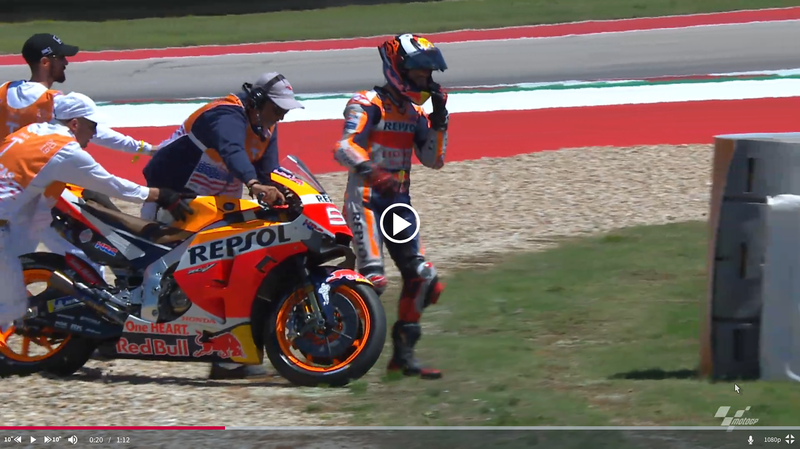 The bumps turn the Austin racetrack into a rodeo, the MotoGP bikes into bucking broncos. At close to 350 km/h along the back straight, the bikes become very difficult to control. The bumps turn into whoops, a motocross track taken at light speed, and almost impossible to ride safely. Turn 2, that glorious sweeping downhill right hander has a bump in it which threatens to unseat anyone who takes it at the speed it begs of a rider. Whether the work undertaken to try to address the problem will be sufficient remains to be seen. “I check a little bit and I know that they did a few modifications,” Marc Márquez said. “They didn’t do what we asked in the Safety Commission. But we will see in FP1 what is going on, how is the track.” Past experience holds out little hope. The area around Turn 10 has been resurfaced, and the top of some of the larger bumps has once again been shaved off. That didn’t make a great deal of difference last year, but we will have to wait until Friday to see if it has been effective for the 2019 race. Since MotoGP first returned to Argentina in 2014, we have had customs hold ups, a collision between Valentino Rossi and Marc Márquez, rear tires blistering and shedding rubber, compulsory pit stops, complaints about bumps causing riders to crash out, start line chaos, another collision between Marc Márquez and Valentino Rossi (and between Marc Márquez and a whole bunch of other riders), just to mention a few things in no particular order. On more than one occasion, the Argentina round of MotoGP has forced adjustments to the rules, or clarification on how the rules are applied. As sure as night follows day, intense criticism (whether deserved or not) of Race Direction follows a MotoGP race at Termas de Rio Hondo. It feels as if MotoGP has been talking about nothing but aerodynamics for a while now. It has been growing in importance since the advent of spec electronics made winglets a viable method of managing wheelie control, but the protest and subsequent court case against Ducati’s use of its swing arm-mounted spoiler has meant we have spoken of little else since then. The decision of the MotoGP Court of Appeal did nothing to quell the controversy, but then again, whatever decision it made was only going to make the arguments grow louder. But there is reason to believe that we are approaching the endgame of Spoilergate. On Friday night, reports say, Honda submitted its design for a swing arm-mounted spoiler to Technical Director Danny Aldridge, and had it accepted. This would not normally be remarkable, were it not for the fact that Honda had also submitted the same spoiler on Thursday night, and had it rejected as illegal. How did this happen? On Thursday, Honda presented the spoiler, saying it was to generate aerodynamic downforce, reportedly. That goes against the guidelines issued by Danny Aldridge, and so he had no choice but to reject it. On Friday, Honda submitted the same spoiler, but told Aldridge it was to increase the stiffness of the swing arm, according to British publication MCN. Because that is not prohibited under the guidelines, Aldridge had no choice but to allow it. For a place which 95% of the paddock hates going to, Qatar certainly knows how to make us want to come back. The area between Doha and the Losail International Circuit has been a mixture of noisy construction, omnipresent sand and dust, and an ever-changing and convoluted road system (the route to the track regularly and literally changing overnight) ever since I first went to a race there in 2009. But once at the circuit, the track layout serves up some of the best racing in the world. Fittingly, the title sponsor for the Qatar round of MotoGP was VisitQatar, the Qatari tourist office aimed at stimulating inbound tourism to the Gulf peninsula. To be honest, the best thing VisitQatar could do to attract visitors to the country is just play all three of Sunday’s races on a loop. In the Moto3 race, the first eleven riders all finished within a second. The first five riders in MotoGP finished within six tenths of a second. And the winning margin in all three races was five hundredths of a second or less. These were races decided by the width of a wheel, the winner in doubt all the way to the line. The MotoGP race was a thrilling affair, a close race from start to finish, with wild passes as far as the eye can see. Riders jockeyed for position, vying to make their contesting strategies pay off. Yet it still left some fans feeling empty, with the impression that they were being cheated of an even better race if the riders has been willing and able to go flat out as soon as the lights went out all the way to the end. You don’t expect to be cold in the desert. On Friday evening, most of the paddock was wandering around in short sleeves and t-shirts until after 9pm. On Saturday, people were pulling on jackets shortly after sunset. By the time MotoGP finished, people were starting to lose feeling in their hands. It wasn’t just the temperature. The wind had picked up enormously on Saturday, blowing sand onto the track in places, and blowing any residual heat from ever nook and cranny around the circuit. It was not the normal chill of the desert evening. It was cold. That caused more than a few problems during the evening. Session after session, class after class, riders fell, mostly at Turn 2. That is the first left-hand corner for nearly 2km, after the final right-hander before the long straight, and then hard braking for Turn 1. That is a lot of time for the front tire to cool down, especially when there is a hard headwind blowing down the main straight, whipping the heat from the tires. And so hope and expectation meet reality. On Friday, we could stop fantasizing about just how good this season might be, and see for ourselves just how close the field is in the premier class. Well, how close it is outside Marc Márquez’ insane record-crushing lap in FP2, made following Maverick Viñales around and using him as a target. It may only be Friday, but Márquez beat Johann Zarco’s pole-setting lap record from last year by three tenths of a second. And they will only be going faster gain tomorrow. Any concerns that Marc Márquez might ease himself back into MotoGP, nursing the shoulder he had operated on last year until it was back at 100%, were laid to rest. “No, I ride full attack. I am riding full attack, I am pushing,” Márquez said. Viñales, who knew that Márquez had been following him when he made his fastest time, joked about it being a magnanimous gesture towards a weakened rival. “Yeah, I knew he was there, but I know he is injured, so I tried to help him a little bit…” the Monster Energy Yamaha rider joked. It is tempting before each season to say that this is going to be the best season ever. It is a phrase that oscillates somewhere between hope and expectation, though more often than not, it is hope which has the upper hand. The 2019 MotoGP season promises to swing the balance back toward expectation, as the sport goes from strength to strength. The reason MotoGP went from having 17 bikes on the grid in 2010 and the races decided virtually by qualifying position is simple. Thanks to a mixture of coaxing and cajoling, bribing and bullying, Dorna managed to get most of the rule changes they wanted. First, a switch back to 1000cc, bore limited to impose a theoretical rev limit (which has remained theoretical, as revs soar back above 18,000). Next, the adoption of spec electronics, forced through with the threat of CRT bikes, along with a promise by the factories to supply bikes at an affordable price. Then the introduction of the more user-friendly Michelin tires. The concession system, whereby successful factories have engine designs frozen, giving less successful factories a chance to catch up. And finally, an influx of talent to fill a field of closely competitive bikes.